So let’s say you’ve recently decided to remodel your kitchen with us. You’ve chosen the colour of the walls, you’ve decided on your tiles, and you love your new cabinets. You may think the aesthetic decisions are done. But don’t forget one of the most important parts: the splashback! 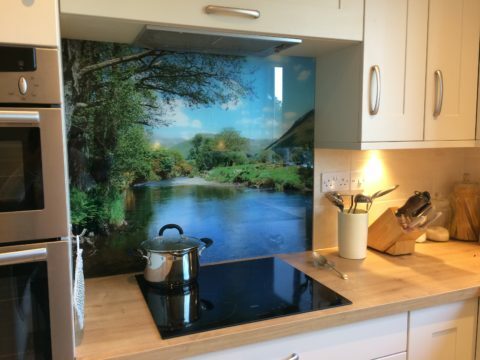 You may think that splashbacks are purely practical. Now that is true, because they do make your life a lot easier. But much more than that, they’re a great way to style your kitchen and make it personal in line with your tastes. And they’re anything but boring. Luckily for you, Modern Homes is here to guide you on how to choose the perfect splashback for your kitchen, whether you’re actively thinking about remodelling it entirely or not. Splashback is the name we give to those separate tiles/glass on kitchen walls that protect your wall from any spills or – you guessed it – splashes. They’re essential to kitchens because they will also protect your walls against moisture and cooking debris. Because they’re a different material from the wall itself, it means you’ll only need a cloth and some product to wipe it down. You’ve probably seen them everywhere. We bet you have one in your kitchen right now. Can you imagine how much harder it would be to clean after you cook if you didn’t have them? 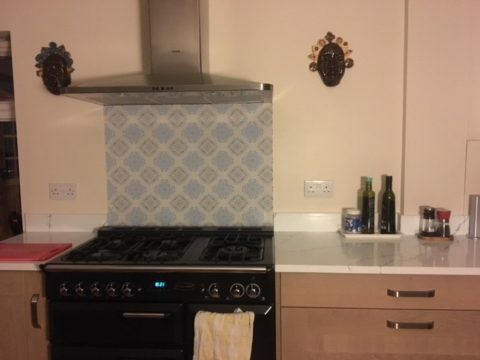 Where can I put splashbacks? Because splashbacks are an easy to way to keep the surface clean, they can technically be used anywhere – from your shower to your kid’s room. The most common use of splashbacks is in the kitchen, as it makes the workspace more hygienic. You’ll mainly see them behind hobs and kitchen taps, as well as behind countertops. What type of splashback should I get? A very popular option for splashbacks is tiles. They can come in any colour and pattern, and it will be up to you to choose the scheme for your dream kitchen. If you want an easy option, then you won’t go wrong with glass. Because of its reflective qualities, not only will it make the space seem bigger, it will be quite simple to clean. Of course, you can also opt for stainless steel or acrylic. There are even options for copper splashbacks, stainless steel, and chalk board you can scribble on. 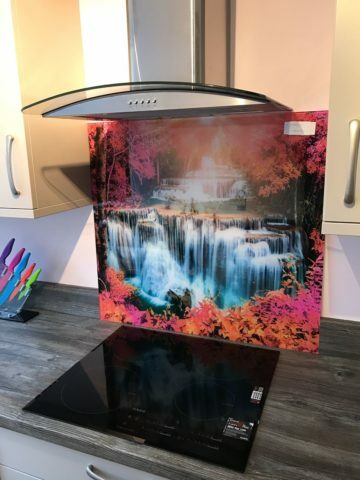 Marble and mirror splashbacks are on the market but tend to be harder to keep clean, so if you’re a keen cook these may not work as well for you. Just remember: if you’re going to put a splashback near your gas hob, you should use a material that’s heat-resistant. This means that you should stay away from most plastic as it’s too melty! After you’ve chosen the material, then it’s time to customise it. 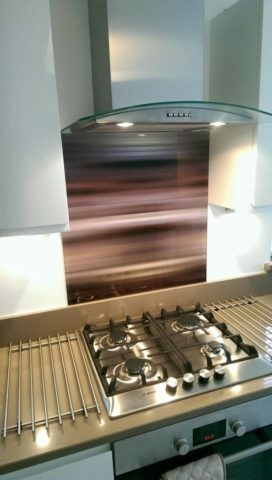 Splashbacks are a great way to show off your colours and creativity. If you’re leaning more towards tiles, then you can be modern with the way that you choose to customise them. Tiles can be arranged in a variety of patterns so have a look on Pinterest for some inspiration. Have a look at brick bond, linear, and herringbone to see if you have a preference. When it comes to colours, the sky’s the limit. It’s your choice if you want to complement the rest of your kitchen colours, or if you want it to be a total contrast to everything else in the space. It’s also worth saying that if you want a textured pattern, then you may be giving yourself a bit more work when it comes to cleaning it. But trust us, it will be worth it. After you’ve chosen the colour and pattern, it’s time to choose the height and length. If you’re thinking of placing it behind your cooker, then we would recommend a full-height design that covers the entire wall. It will bring your kitchen to life, and make it manageable to keep clean. If you’re on the opposite side of the scale and are thinking of something smaller, then that’s not a problem either. You can put smaller splashbacks by the counter where you prep food too. We’ll let you in on a secret: if you do that, choose a lighter colour so you can see exactly what you’re making and how clean everything is. That’s not a problem! Why don’t you take a look around the recent remodelling work that we’ve done to see if that sparks your interest? 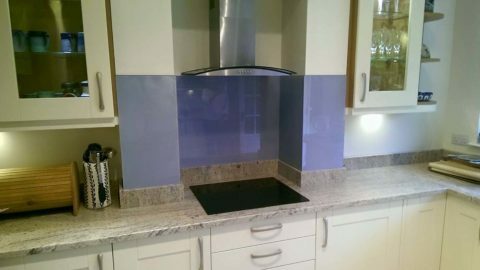 For this kitchen, we used a purple splashback as the feature colour which we think gave it a sophisticated look. (http://www.modernhomesleamington.co.uk/a-stunning-kitchen/). In this example, we used a light blue contrast to match the colour of the other walls, and we think that was a great choice (http://www.modernhomesleamington.co.uk/a-stylish-family-kitchen/). And in this example, we kept it clean with a cream-coloured splashback which contrasts beautifully with the dark counters (http://www.modernhomesleamington.co.uk/a-modern-kitchen/). Still unsure? Need to see some samples? That’s where we come in. Our Modern Homes team is here to help. We’ll answer any questions you may have on the subject, so just pick up the phone to call us or send us an email. We can help you choose the material, the location and the colour. But you’ll get the final say. We’re here to make your life easier, and just like splashbacks, we don’t want to create a mess.